After my daughter was born, I took a leap of faith and had laser hair removal on my legs. Except for the teeny tiny fact that I still have hair on parts of my legs. It’s nothing obvious and the hair is so fine others probably don’t notice, but it drives me insane. So once a week I break out my razor and smooth things up, but we all know razors don’t always do the trick. They leave behind friendly reminders, like razor bumps and ingrown hairs. And if that weren’t enough, my knees love to show off just how dry they can get each day. I mean, who doesn’t love dry, scaly knees in the summer? Not I said the fly. And not me this summer - I’ve been saved by my favorite summer couple. Once a week, I use the Smoothie scrub in the shower, followed immediately by the Righteous Butter. A few days later, I’ll shave and pop the shea butter on afterwards. Ladies, my legs have never been this smooth. Naturally, I began scrubbing my whole body too, because why not? And besides smelling amazing, I’m head-to-toe touchable soft. The Smoothie maple scent is noticeable when you put it on, but it doesn’t linger past the shower. The Righteous Butter is also perfumed, but lessens drastically as it is absorbs into the skin. 100% Honesty: As someone who is extremely sensitive to perfumes and thick creams in general, I was shocked the shea butter didn’t bother me. I'm just about done with both tubs and have already ordered my replacements! 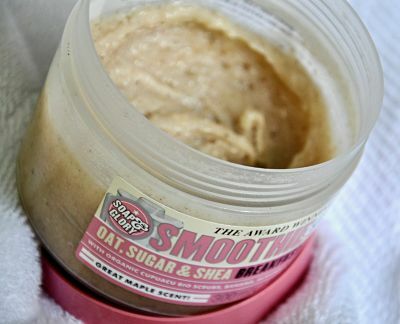 Want your own Soap & Glory Smoothie Scrub and Righteous Butter? I got mine at Ulta during a sale, but Walgreens also carries the brand. Try them out and let me know what your think below! And, I’d like to say thank you to my girl, Trina at Baby Shopaholic, for saving my life and turning me onto the brand and scrub during one of her InstaStories. If you don’t follow Trina on Instagram, check her out. Her kids are adorable, her style something fierce, and her cooking leaves me drooling on my phone.